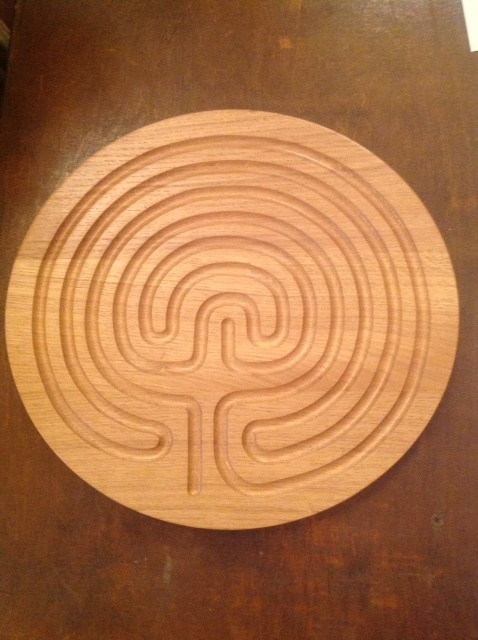 In Chapter 6 we discuss different examples and uses of labyrinths for contemplation, restoration and reflection, and showcase the work of Dr Jan Sellers on labyrinths for learning, teaching and quietening the mind. Here we offer video accompaniments to this section, links to other sources of information on labyrinths and elaborate on how we are using portable labyrinths to create alternative ‘spaces within places’. 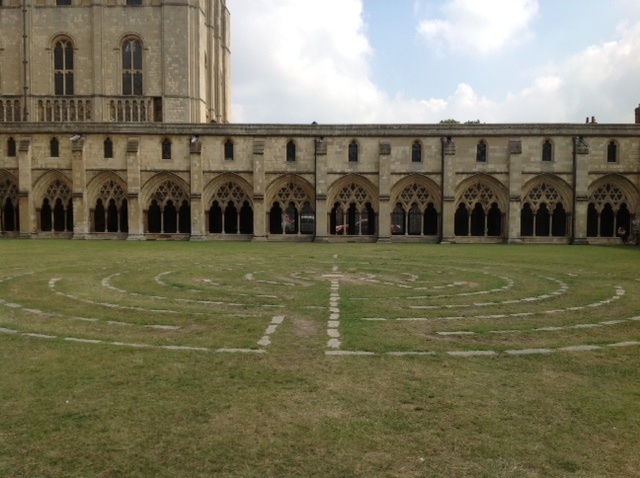 First of all, in these two videos, Jan gives us a tour of the meadow labyrinth at the University of Kent, England, and describes the history of labyrinths, their use and how to walk a labyrinth, and how labyrinths can be used inclusively in learning and teaching. 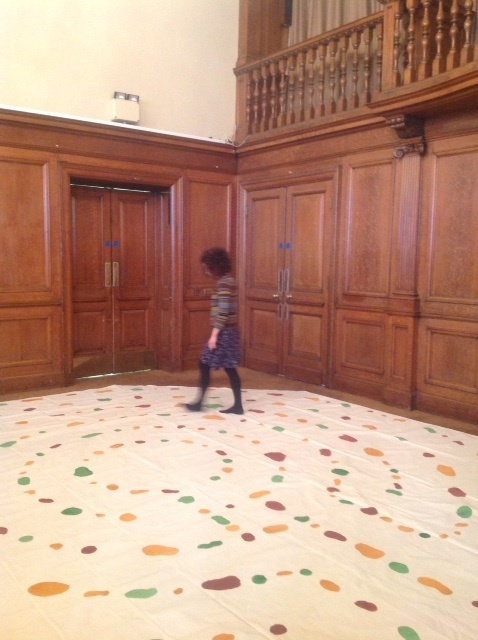 In the second video, Jan discusses how labyrinths can be made accessible for all users, and describes how finger labyrinths, carved out of wood or stone, some with sand through which to trace the grooves of the hidden shape, can offer relaxing alternatives to walking. Since first meeting Jan, the University of the Arts London has become one among many in the HE sector in the UK to be adopting labyrinths to support contemplation and stress reduction with staff and students. 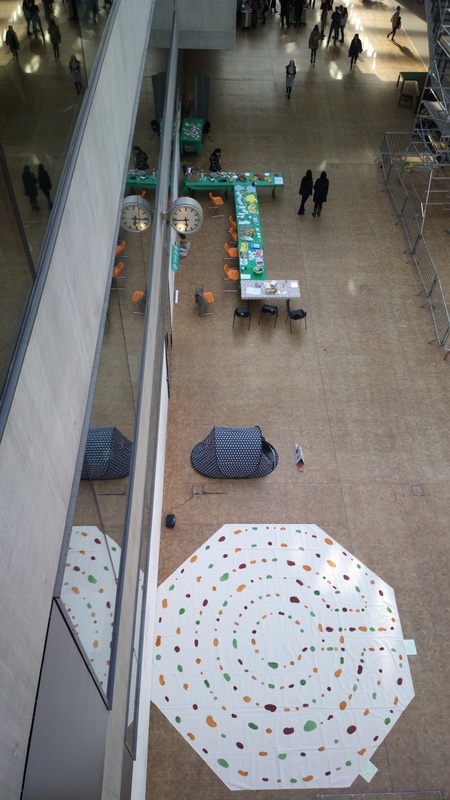 Decorated by the counselling team in a studio high above London’s West End, the labyrinth now travels to a variety of events and accommodates itself in a variety of places – here shown in the historic setting of Chelsea College of Art and Design and aerially viewed within the cavernous walkway of Central St Martins’ Granary Building. 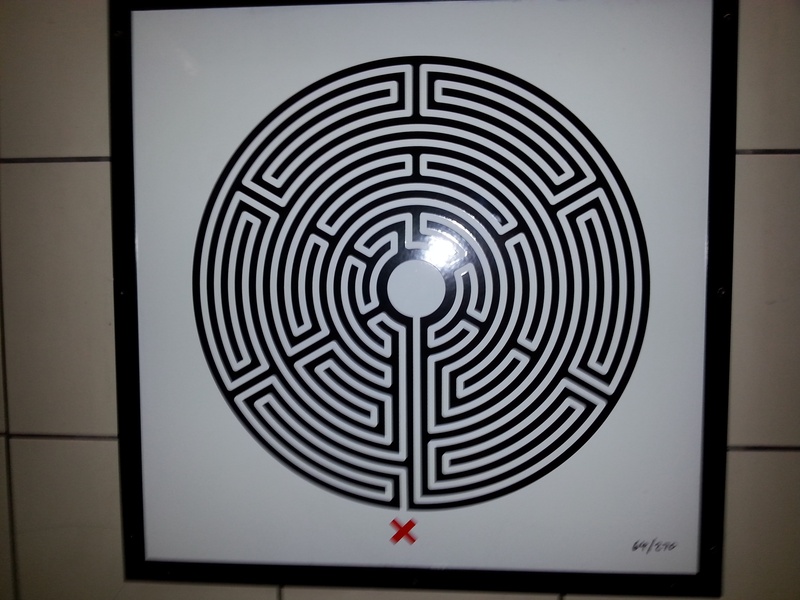 In video 1 Jan refers to the University of Kent labyrinth as an art installation, which links neatly to the Labyrinth project of artist Mark Wallinger, a series of artworks located across stations of the London Underground in commemoration of the Tube’s 150th birthday. The kind of intrigue that accompanies exploration of a physical labyrinth in any kind of setting is now being stimulated by the appearance of these myriad depictions of labyrinths in unexpected places (-our labyrinth photograph below is at the top of the escalator at Waterloo Station) .